I read somewhere that Steven Spielberg wanted to make a movie about Lincoln BEFORE Doris Kearns Goodwin even wrote the best selling Team of Rivals. Kearns Goodwin notes she met Spielberg years ago, that he was obsessed with Lincoln and when he learned she was planning on writing a book about the man, asked her to keep him posted on her progress as he was interested in acquiring the screen rights. I saw her on a talk show recently, confiding her main concern about the film was that we see Lincoln's sense of humor. Thankfully we do. I saw the film yesterday and couldn't help smiling at the succession of anecdotes the iconic president tells, occasionally to the disgust of his detractors. Beyond that, I found this film, detailing the behind the scenes efforts of the passage of the 13th amendment incredibly moving. From the Saving Private Ryan realism of the Civil War battles to the rip-roaring battles on the floor of the house I was swept away with the passion and the politics of this pursuit. Oh, the epithets they hurled at each other! Should you see Lincoln? The whole country should see Lincoln. The movie is the work of a master at the height of his career and should be Required Viewing of all American high school students with an open invitation to the rest of the world to see what the fuss is about. There are numerous reviews (read 'em here) hailing the movie as Oscar worthy and Daniel Day-Lewis as a shoe in for a Best Actor nominaton, and at this precise moment in time, I imagine he will win it. Film buffs and movie critics alike will be talking about Lincoln, about Day-Lewis humanizing of the iconic president, about Tony Kushner's script, about a whole slew of amazing performances including under-rated but always first rate actor David Strathairn (Good Night and Good Luck) as William H. Seward, the likeable Sally Fields gone off the rails as First Lady Mary Todd on the edge (wouldn't you be?) and David Spader fleshing out his resume as the sleazy leader of the band of operatives charged with procuring the needed votes. For me though, walking out of the movie theatre still drying my eyes I couldn't stop thinking about Thaddeus Stevens and Tommy Lee Jone's powerful portrayal. Stevens was a radical Republican (modern day Democrat) believing that African Americans should not only be equal in the eyes of the law, but that they were in fact equal - an extreme position for the times. He put aside that position in order to pass the 13th amendment. I admit to forgetting half my high school history and was thunderstruck at just how important a role Stevens played. Surely Lincoln could never have passed the bill without Stevens lifelong passionate dedication to the cause of equality? That Stevens seemingly compromised his principles in order to move the struggle forward was painful, but beautiful to see. 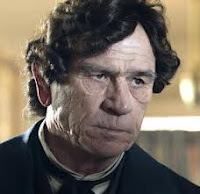 Tommy Lee Jones, stone faced, gravelly voiced, dragging a heavy leg (Stevens had a club foot), head topped by period wig, weighs in with force and has the gravitas to pull it off. I think it's the very best work of his career. Deserving of the Best Supporting Actor WIN that I believe he's going to have on Oscar night. My son Russell and my husband, Mark, were lucky enough to see this movie at the Director's Guild where Steven Spielberg did a Q & A after the film. Spielberg said he didn't cast this film based on looks. 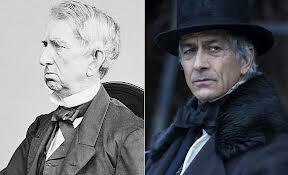 Regardless of the director's parameters, one look at the real life Thaddeus Stevens and Tommy Lee Jones, as well as William H. Seward and David Strathairn (on the left), and intended or not, the resemblances are uncanny! I really am so excited about this film that I can hardly stand it. As soon as I catch up from work stuff, I plan to head to the theatres to catch it. Daniel Day-Lewis always pulls off an amazing role. Emily, I think you're going to love it. Good luck getting back on track after your amazing vacation. You make this sounds delicious. I can't wait to see it, but I don't think I'll convince my daughter that we should go see it while the guys go see James Bond. I was embarassed to realize my shoulders were shaking at one point; I was so moved. I had to watch it as I saw it with Russell who would probably have been humiliated. As it is he told me "I heard you sniffling Ma." I admit at first what drew me to see the film was James Spader. No kidding, I was so excited finding out he was in it, albeit in a small supporting role. But once I began watching it, the superb acting from just everyone was the attraction. 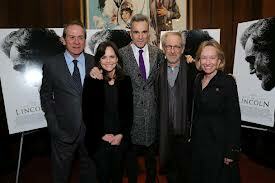 But I must say, Daniel Day-Lewis's performance is the charismatic, major appeal, hands down. He's brilliant. I'm with you... I think he's going to win the Oscar, and, Tommy Lee Jones the supporting. And I'm sure, a few more other ones, including Best Screenplay. Thanks for all the info here... interesting to see the real, historical photos. And I read somewhere that Spielberg did try to find similarity in looks in his casting. No matter, he has crafted an epic production. I went to see Lincoln today. I wasn't sure that it was for me, and I really should have trusted that feeling. As a non-American I found it quite confusing. The major names of the civil war era are familiar to us out here, but not specifics. I was very surprised that it was the Republicans fighting for abolition of slavery- then I see in your post about modern day Democrat, and I'm even more confused. In truth I found all the political back and forth a bit boring, mainly because I was struggling to understand it. I'm sorry you didn't enjoy it but I'm not completely surprised. I just re-read my post and I see I pronounced pompously "The whole country should see it" I did go on, didn't I?! At the core of that statement is an understanding, probably unconscious on my part, that this is a film created by and primarily for, Americans. Not that Stephen Spielberg would want to limit his audience that way but realistically I would imagine many non-Americans would be confused. As well as many Americans!!! I do think it's a beautiful film, and a valuable instrument of education; one that should be shown to all American students during their history classes. I have several friends - born and bred Yanks - who found the film too talky and a job to keep up with. Our son Russell loves history and loved the film, but he was completely familiar with the material. I may have been less moved had I not had his tutelage beforehand.